The United States imported $2.3 trillion worth of goods and exported $1.6 trillion in 2012 alone, according to the U.S. Census Bureau. A big chunk of that volume moved between the United States and next-door neighbors Canada and Mexico. But the list of America's top trading partners includes countries in nearly every corner of the world—from Brazil to Germany, to Saudi Arabia, India, China, and Japan. The sheer distances involved make global trade a formidable challenge. So do the myriad regulations that shippers must satisfy each time they move goods across a border. A company that masters the fine points of global trade management (GTM) can gain time, money, opportunity, and customer satisfaction. Technology vendors offer a range of GTM solutions designed to help shippers whose businesses reach around the world. The world is large, but when it's time to implement a global trade management (GTM) solution, it's often best to start small. A pilot implementation focused on a well-defined segment of your business can help pinpoint and solve potential issues before they become problems. That makes it easier to roll the system out to the rest of your supply chain. "A pilot is a learning opportunity for the GTM solutions provider and implementation partner, as well as the shipper," says Ramji Mani, an associate vice president specializing in manufacturing and logistics at Teaneck, N.J.-based Cognizant Business Consulting. A pilot provides valuable information in areas such as: how well the shipper understands its requirements for the system; what it will take to integrate the new solution with other systems; what training employees will need; and total cost of ownership. One way to focus a GTM pilot is to deploy the solution for a single trade lane. "The trade lane-based approach is a way for organizations to understand all possible variations that might occur within a particular lane, and apply that knowledge to the next set of implementations or trade lanes," says Mani. Within one lane, a company might test the solution for all its trade functions or for a subset. Which route the company takes can depend on many factors, including the complexity of the company's requirements; the kinds of functions being implemented; the software's capabilities; the complexity of the trade laws involved; trade volumes; and how well prepared employees are to use and support the software. Another approach is to run a pilot that covers specific functional areas, no matter the trade lanes involved. "These areas can be incrementally increased to cover entire functions as the pilot is stabilized," says Ravi Joshi, a consulting manager within the same business unit at Cognizant. Shippers should keep in mind that no one-size-fits-all approach works for piloting GTM solutions. Consider, for example, shipments moving from Denmark to Houston. "If the consignment is for flammable goods, the documentation and compliance would be a lot different than if the consignment is food grains," Joshi says. "Each trade lane needs to be modeled for each scenario." When officials at Mack Truck Inc. and Volvo Group North America decided to implement a global trade management (GTM) solution, their main goal was to better control the quality and cost of international trade compliance activities. Mack Trucks is part of the Volvo Group, a global manufacturer of trucks, buses, and construction equipment, as well as drive systems for marine and industrial use. Robert Ellis, senior customs compliance manager for Mack Trucks and Volvo North America, is responsible for ensuring that those two business units fulfill all their legal obligations when shipping finished vehicles or parts into or out of North America. The company started investigating GTM solutions so it could stop using a forwarder and bring trade compliance in-house. "The freight forwarder's bills were high and confusing," says Ellis. "It got to the point where we couldn't verify what the charges were related to." Nor could the forwarder prove that it was doing the necessary denied-party screenings. "Because Volvo is a high-volume importer and exporter, we wanted to make sure that we were moving goods in compliance with those regulations," Ellis says. The forwarder hadn't actually caused any problems or border-crossing delays. "The forwarder was good about delivering the freight expeditiously, and doing the Automated Export System filings," Ellis says. "The main problem was lack of transparency. We wanted to make sure we were operating in compliance, and controlling our costs at the same time." Early in 2010, Mack and Volvo North America began phasing in several GTM solutions from Integration Point, a technology vendor based in Charlotte, N.C. That Software-as-a-Service (SaaS) solution stood out from other products the company considered because it's particularly user-friendly, Ellis says. The first module the company implemented generates Importer Security Filings (ISFs). Also known as 10+2, the filings fulfill U.S. government requirements to provide data about inbound shipments to U.S. Customs and Border Protection 24 hours before loading a shipment on a vessel. In May 2010, Mack/Volvo also started using Integration Point to manage compliance for finished vehicles exported from the United States. In January 2011, it expanded the solution to cover a specific kind of truck parts shipment—"kind of a Mack-in-a-box," Ellis says—bound for assembly plants in Venezuela and Australia. At the same time, Volvo North America started using the solution for all parts shipments globally. Implementing the system was a challenge because Mack/Volvo had to provide data to Integration Point from several mainframe systems. "It took a lot of mapping to understand what our capabilities were," Ellis says. For Volvo parts shipments, the company had to provide data from a different, soon-to-be-replaced, mainframe-based system. "It's a temporary measure until we get a new warehouse management system in place within the next two years," Ellis says. "Planning for the new system, while trying to work with the current one, is very complex." But it has been worth the effort. 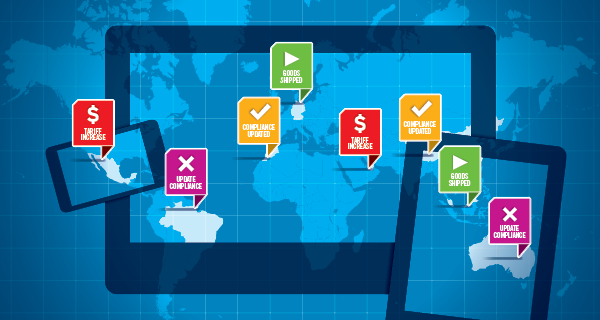 Besides saving money and gaining assurance that it's meeting all necessary regulations, the compliance department has gained better control over smaller, ad-hoc international shipments. In the past, individuals simply boxed those up and turned them over to package carriers on their own. Now, individuals take the box to the shipping department at their location and create a record in Integration Point. Company officials are thinking about implementing additional Integration Point suite modules in the future. "We're looking at the Customs-Trade Partnership Against Terrorism or global classification modules—capabilities that we're not taking advantage of today but could handle more efficiently than the systems we have in place," Ellis says.